Brockway approached us to evolve their existing brand identity and website, and create a sub-brand and product brochure for a new ‘premium’ range of carpets aimed at the design-conscious consumer, the end objective being to sell the new carpet range at a higher price point. Haime & Butler have acted way beyond what was initially asked of them and enabled me to see the bigger picture for the Brockway brand. I think we have the best website and marketing collateral in our sector. Our recommendation was to reposition the whole Brockway brand as the premium manufacturer of quality, British-made carpets whilst enhancing and maintaining the existing brand values of a family-run business with real traditional craftsmanship. As part of the overall brand re-design, the Brockway carpet ranges were placed into two distinct branded collections – Classic and Designer – to help clarify Brockway’s offer and to elevate its overall market position. Website traffic, brochure and sample cutting requests increased. Enquiries to set up overseas distribution networks. the overall look and the new identity is contemporary, smart and stylish without losing its friendly and approachable personality. Fully content-managed site that enables Brockway to add new carpet ranges, list all stockists, respond to all enquiries and send and track sample cuttings. 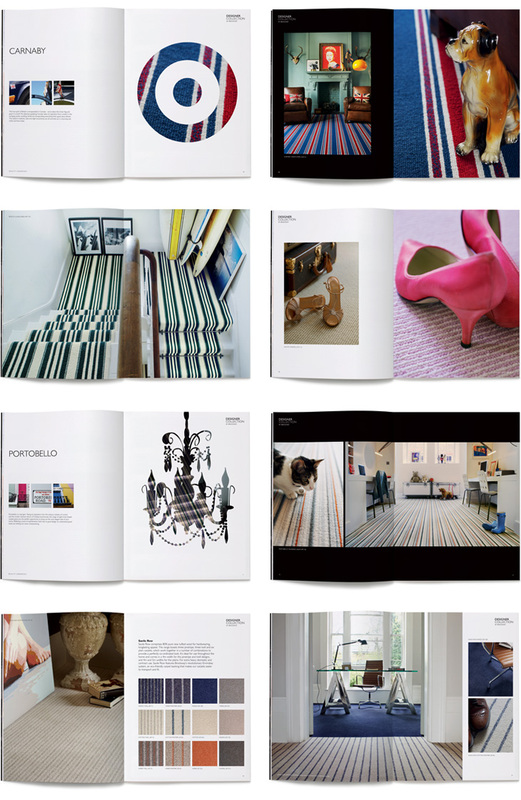 Carpet swatches and technical information for stockists and interior designers. The prized Herdwick flocks, which graze the highest of England’s mountains in the Lake District, provide yarn for Brockway's unique Lakeland Herdwick 100% wool carpet. Highly contemporary and desirable all year round, not just for Christmas! Visual identity for Brockway Carpets’ colour-matching service, where customers can create their own, completely bespoke carpet. The customer sends in a colour swatch to match, chooses a style and weight of carpet from the Brockway range and they do the rest.